I had to get up early this morning to pull blankets, since it went from a high of 10 degrees over the weekend to 30 yesterday, but with clouds and a wind chill and a general refusal to warm up very quickly. So the horses had had their blankets on since Friday evening, and since it was supposed to be in the low 50s today, I knew I couldn't wait very long before getting their blankets off. I have been having a hard time falling asleep lately, though -- extremely unusual for me -- so I woke up tired and slightly sick this morning from the lack of sleep. I had been planning to ride, but with the way I felt, I decided to just pull blankets and go back home, maybe to take a nap. So I knew he wanted to do something. 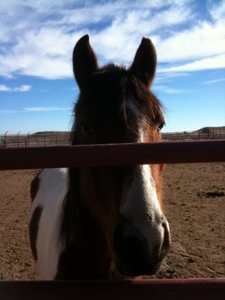 After all, it had been nearly a week since he'd been ridden last, thanks to the ridiculous weather. So I saddled him up. We didn't ride for long, really, only about 20 minutes, but it was a nice, relaxed ride in the sunshine. We walked around the obstacle course a little (which woke him up a bit more than I wanted -- he'd been sleeping in the sun, so he was relaxed when I got on), then did a short walk and trot workout in the outdoor arena, focusing on keeping the trot very relaxed and even-paced. He needed a few reminders (half-halts) not to speed up heading toward "home" down the long sides of the arena (a bad habit he has always struggled with), but with me reminding him and him giving me what I asked for, he did very well and I was pleased. I wasn't wearing good jeans for riding -- they felt slippery in the saddle compared to my usual riding jeans -- so I opted not to canter. After that, we walked around outside of the arena a little more and headed back to the cross ties. Since we are supposed to have some nice weather for a bit, I took Rondo's blanket in to be washed and repaired. My mouthy baby -- he plays tug-of-war with the front of it while he is wearing it, and has been ripping the trim off and taking one of the shoulder gussets apart. I cringe to think how much that could cost to repair, but it's a really nice Weatherbeeta blanket and I would like it to last until he grows out of it (which I have no doubt he will, at some point). While I was at the tack store to drop off the blanket, I did some shopping. Isn't this a cute watch? Instead of numbers, it has arena letters. What a clever idea! If I was into wearing watches, I would have bought it on the spot. I have been wanting to get Panama a jumping saddle for a little while now, but after determining last fall that he will do well at showing after all, it became more of a priority than it used to be. 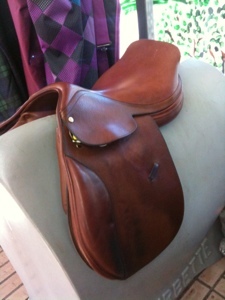 The all purpose English saddle I ride him in is very comfortable, but it also is a very cheap saddle (not leather). I bought it because of the price tag when I first started looking for a saddle for him five years ago, expecting that he would change as he grew and it would need to be replaced before long anyway; but he didn't, and the saddle has continued to fit both him and me all along. While I still like it and will likely keep it for trail rides and casual riding, I do dislike how thickly and firmly padded the knee rolls and the flaps in general are, which was half of my reasoning for wanting a new saddle, as I think it muddies up my leg cues with Panama. (The other half was that since we are doing more jumping now, and will possibly even be doing some showing this year, I wanted an actual jumping saddle, not to mention something a little nicer. I was just browsing saddles today, when I spotted this one. I had no intentions of buying one quite yet, so I haven't done a withers trace on Panama, but the tack store does allow you to take a saddle for three days to see if it fits before you buy. I also spotted a lovely cob size bridle in the same color as the saddle, which is now on hold for me until I find out if the saddle is going to fit. I also need to verify that the bridle is going to fit -- Panama has a small head, and I have to buy cob size of everything, and still sometimes have it altered too. Since this bridle is a pretty pricey piece of leather, I want to make sure it will fit before I buy it -- but it really would look so pretty with this saddle! Tack hunting is fun. 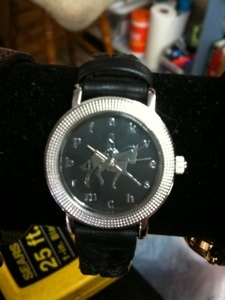 I like the watch -- a perfect gift for the dressage rider. I thought the same thing about the watch -- and then I decided that I would wear it anyway, even though I don't ride dressage! Too bad I don't wear watches very often!